If you've heard it, you can't forget the awesome sound of the liquid-cooled DOHC five titanium-valved single in the baddest motocrosser ever built - the YZ450F. We had no choice but to adapt that engine for use in the most serious ATV the planet's ever come up against. We call it the YFZ450, and nobody else builds anything like it. Not only is the hybrid 439cc DOHC titanium-valved five-speed engine far superior to anything that's come before, at 350 pounds, the YFZ450 is endowed with the highest power-to-weight ratio of any four-stroke ATV ever built. Yes, it even has electric start, and when you open the 39mm Keihin carburetor all the way and take aim, you'll also appreciate the lowest center of gravity in the class and the latest industry-leading suspension technology. But we’re just getting warmed up here, so why don’t you visit the Features & Benefits page to get a closer look at the YFZ450's list of incredible features. 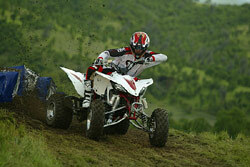 You'll see, it all adds up to the lightest, most powerful, best-handling ATV ever produced. It's simple. You'll either be riding a YFZ450 this season or trying to catch up to one.